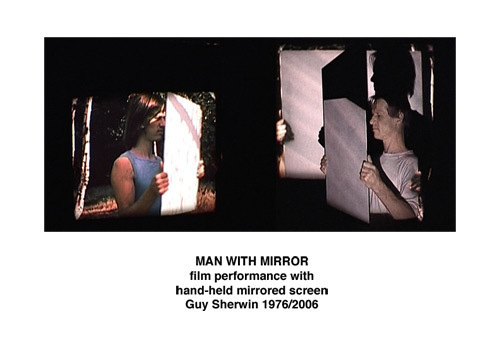 In Man with Mirror, Sherwin filmed himself in a London park manipulating (tilting, panning, rotating) a white-backed mirror. The proportions of the mirror exactly match the 4:3 ratio of the super 8 film frame, and Sherwin’s movements consciously play with the fixed frame of the camera. 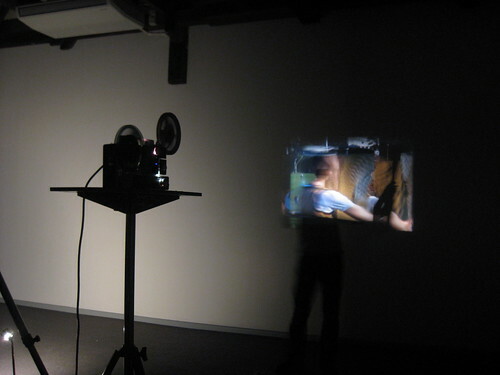 In performance, the film is projected into a darkened space in which Sherwin again manipulates the same mirror/screen, sometimes revealing the projection, and sometimes using the mirror to re-project the image around the room. The result is a confusing and beguiling visual experience. As the years pass, the “real” Guy Sherwin ages, whereas the 1976 “filmed” Sherwin stays forever in his late 20s. Thus the audience’s (and the performer’s!) experience of the work continually changes over time, and the work becomes a poetic reflection on change and mortality. Given that Man with Mirror involves a performer working with film footage of himself, re-enacting this piece necessarily involved shooting a new film. However, since there were two of us working on this re-enactment, we decided to each produce a new version of the work (hence the name of our re-enactment, (Wo)man with Mirror). In late 2008, we met Guy in Brisbane – where he and his partner Lynn Loo, (and their son Kai) were invited by our friends at Otherfilm. Guy gave us a tutorial explaining the technical complexities of re-creating the piece. 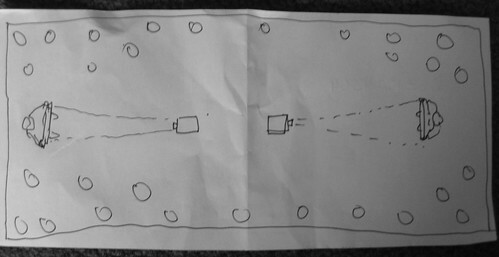 One of the developments we made, in re-enacting the work, was the decision for the two of us to perform simultaneously. 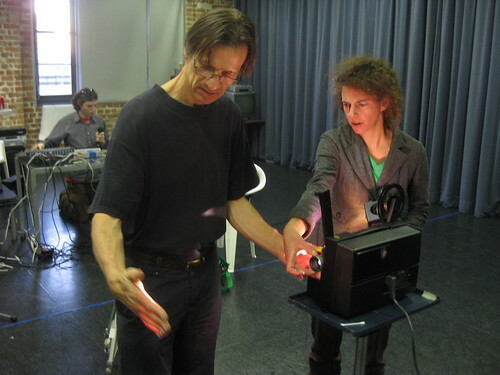 In (Wo)man with Mirror, two performers face each other across the room – in a sense mirroring each other’s movements. Part of our motivation for embarking on this re-enactment was the knowledge that Guy Sherwin could not carry on performing Man with Mirror forever. By the time Sherwin becomes too old to perform, we hope that our own versions of the work will have matured, and we will be able to carry on and extend the tradition. 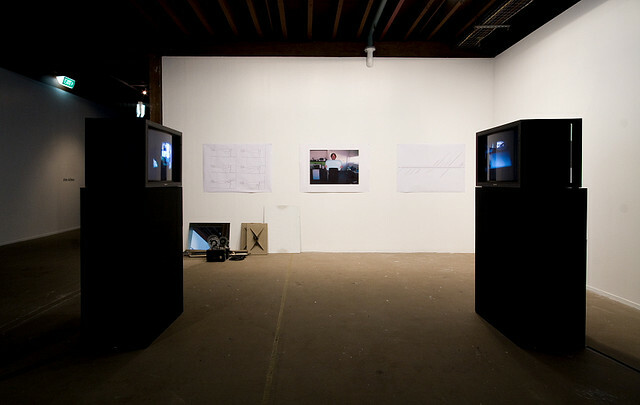 (More photos from the 2009 Artspace installation are here). You can download a pdf of the exhibition catalogue for Imprint here. In an attempt to enable others to produce new versions of the work, we decided to share the knowledge we discovered in the production of the re-enactment. To this end, we published (Wo)man with Mirror: A User’s Manual – a brochure detailing the practical considerations involved in re-enacting the piece. 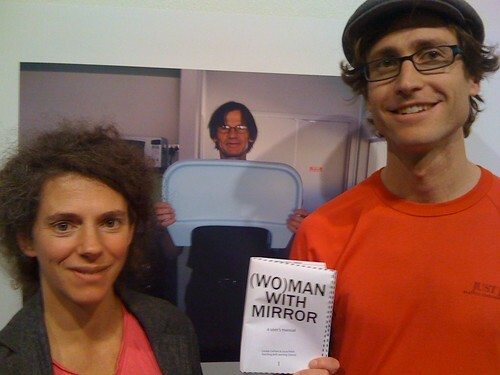 (Wo)man with Mirror was included in the exhibition “Hollow in the Paper” curated by Bec Stevens, at CAST, Hobart, 2013. Catalogue publication here. 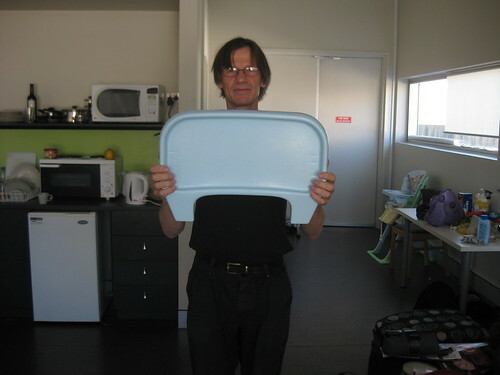 update – I discussed our re-enactment of (Wo)man with Mirror (amongst other works) at a session entitled Re-Enacting Performance Art at the seminar at UOW in late 2012. Here’s a link to the powerpoint slides accompanying my presentation. I was inspired by Guy’s comment that we work hard in our performance, a comment he made after our Unconscious Archives Salon in London. I noticed a few things I’ve never noticed before – by standing away from the wall, in the last section he is able to play with scale, making the image bigger and smaller by stepping forward and backward. He pays little or no attention to his film self movements in the last section – I am always quite slavish to what film me is doing, so this is very freeing. He also does quite a lot of standing with minimal movement and at times, he stands with his back entirely to the audience, something I never do. LI top of projector stand is 147cm from the floor. LC top of projector stand is 137 from the floor. Following from previous comment above here, about heights of projector stand. Need to map the projected face onto the same spot as the physical face. Lucas’ projection needs to be quite high to do this, as the face within the film was lower in the 4:3 frame than physical face. Solution – projection stand higher + Lucas holds his mirror a bit higher.